40 Eridani. The primary (A) is the bright star to the right. Component C is just visible above and to the right of component B in this image. Comparison of the habitable zone of 40 Eridani A with that in our solar system. Image credit: NASA. 40 Eridani is a nearby trinary (three-star) system in the constellation Eridanus. It is also known as Omicron2 Eridani or Keid. 40 Eridani A is an orange main-sequence K star some 4 billion years old. 40 Eridani B is a white dwarf, the first such star to be discovered. 40 Eridani C is a red dwarf and also a flare star with the variable star designation DY Eridani. Components B and C orbit around each other and, as a pair orbit the primary, which lies about 400 astronomical units away. 40 Eridani A is the star around which the Vulcan homeworld orbits in the fictional universe of Star Trek. Astronomers have recently considered if this star might actually have any Earthlike planets and, if so, they might be capable of supporting life. The first problem to consider is whether an Earth-mass planet could have formed around 40 Eridani A, which has two stellar companions tugging at it. The answer to this seems to be "yes". 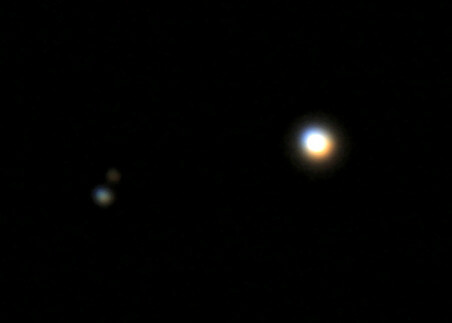 On the Jet Propulsion Laboratory's "PlanetQuest" website, planetary theorist Sean Raymond of the University of Colorado, Boulder, commented: "Since the three members of the triple star system are so far away from each other [hundreds of astronomical units], I see no reason why an Earth-mass planet would not be able to form around the primary star, 40 Eridani A." If such a planet exists, then in order for it to be able to support life as we know it, or advanced Vulcans like Mr. Spock, it would need to have an orbit that would allow it to have liquid water on its surface. This means it would have to move within the region around known as the habitable zone. 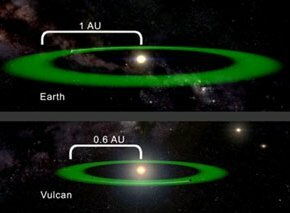 Because the primary star is a K dwarf that is cooler and dimmer than the Sun, the "sweet spot" for Vulcan would be about 0.6 astronomical units from the star – slightly less than the distance of Venus from the Sun. The fact that 40 Eridani A emits a more reddish (longer wavelength) light than the Sun might have consequences for its inhabitants, especially for any plant life present. It has been calculated that, when launched, NASA's SIM PlanetQuest satellite would be able to definitively determine whether there is an Earth-mass planet orbiting in the habitable zone around 40 Eridani A, and could also determine its orbit. If a positive identification were made, it could be followed up by NASA's Terrestrial Planet Finder mission, which would not only be able to take a rudimentary picture of the planet, but also could search for signatures of life such as methane and ozone.